A triple double is usually taken as an example to measure excellence in basketball, but when so many of them happen during losses, you can’t help but feel it’s another statistic being greatly overrated. LeBron James is a great basketball player, one of the best of all-time, but the triple doubles aren’t the measuring stick we should be using. 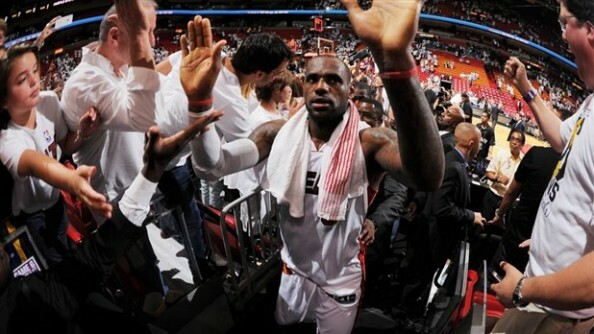 James finished with 32 points, 10 rebounds and 11 assists, as the Heat won game 6 103-100. He also turned the ball over six times, including twice in overtime and twice in the final minute of the fourth quarter. All the pretty numbers mean nothing when you’re mistakes directly lead to your team’s demise. It was his fourth NBA finals triple double and second in this series. 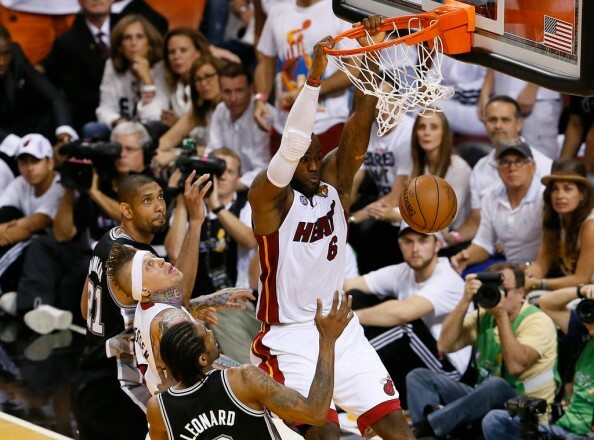 The first one came in game 1 (17-10-10), when Tony Parker hit a shot James could have done more to stop. These numbers remain in box scores and game logs, but what really matters, and what defines greatness, is making the most positive plays for your team when it matters the most. Magic Johnson has 8 NBA finals triple doubles, more than any other player. James is now the only other one in a list that consists of Wilt Chamberlain, Larry Bird, Bill Russell, Bob Cousy and Walt Frazier with more than 2. It shows versatility. It shows a player is involved on the glass, and it shows the player is willing to pass when someone is open. To dig more than that out of these numbers, you need to isolate every single play. Rajon Rondo is a triple double king, but all the players on this list are greater than him, and when his NBA career is over, they’ll all be remembered as better than him. Because he didn’t make great players, up until now, often enough, to define himself in more than numbers. James? It doesn’t matter how many game winning shots or plays he makes, the cloud of not being clutch enough is always hovering over him. People always waiting for the excuse to bring the 2011 NBA finals back at him, or the ‘LeQuit‘ game against the Boston Celtics in the 2010 NBA playoffs. But clutch isn’t only defined by taking the last shot. It’s about taking your team when no one else could have. The Heat were down by 10 points entering the fourth quarter, so James took it on himself to stop taking jumpers, and simply score in the paint. He ended up with 14 points in the fourth, mostly from dunks and layups. Even with a loss, it would have been enough to give him plenty of credit for his clutch time performance, although most people would have focused on him losing an NBA final for the fourth time. James just so happened to turn the ball over twice in the final minute of the fourth quarter. Another twist in the tale that put him in a negative light. With 28 seconds left and with the Heat not doing anything that remotely resembles a planned play, he set out to win the game on his own. So he missed the first three pointer, but got the offensive rebound passed to him, and he didn’t think. The Heat needed points and fast, so James went up for another open three, and hit it. On the next possession, he took another three pointer, without even thinking, missing, but it ended up in the hands of Ray Allen, sending the game into overtime. In overtime? 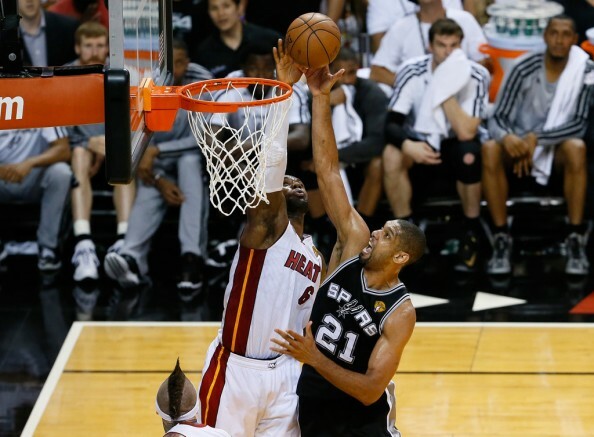 Defense on Tony Parker, which was great all throughout the game, and two more turnovers. But James was also the one who put the Heat back in the lead (101-100) before defense (Chris Bosh twice) and more Ray Allen clutch-ness won the game. LeBron James isn’t perfect, but he’s the best the NBA has to offer. People look for his flaws more than they should, because a certain chain of events beginning in 2010 turned him into a very unpopular player with many, for the wrong reasons. Yes, his numbers, like most numbers in American sports, don’t always tell the true story. But James is much more than statistics, and a game filled with mistakes and heroic moments was another proof of his greatness.